The first thing you probably want to do when getting a new computer is jump right into using it. But hold on! There are some things that you must do and take care of before you get to that point. 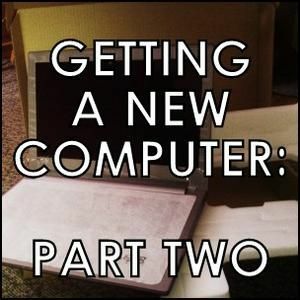 In this article, the second in the Getting A New Computer series, we will cover the first things you must do before starting to use your new computer for those everyday tasks. NOTE: Different sections in each of these articles will somewhat overlap. The articles are not intended to be followed in order from first to last. However, they are published in order of importance. It is important to make sure your laptop battery has a full charge before starting. Some laptops have an indicator light whenever it’s fully charged, but with others you might have to ballpark it. These days, brand new laptops might only take 15-20 minutes to fully charge but in general you should allow for a few hours of charging before starting up your laptop for the first time. Obviously if you have a desktop you can completely skip this step. Although there is a tutorial by Microsoft on how to do this, creating a system repair disk is easy and quick. Go to the Start Menu, type in “backup” and click “Backup and Restore.” In the panel on the left side, you should see “Create a system repair disc.” Click that and follow the prompts. While you’re in the “Backup and Restore” window, create a scheduled backup to an external hard drive or another form of media while you’re at it. Just remember to have the two devices connected around the time of the scheduled backup. The right power settings, whether on a laptop or desktop, are good to have and familiarize yourself with. If you have a laptop, you can easily access these from the battery icon in the system tray. However, no matter what kind you have, you can access them by simply typing “Power Options” in the Start Menu search bar. These will likely happen automatically. But if you’re prompted to do them, follow through – don’t just ignore them. This is a huge tech pet peeve of mine and it’s hard for me to understand why users don’t just listen to Microsoft. 99.9% of the time (percentage guessed) you’re not going to have a problem with an update. What is bloatware (also known as crapware)? It’s basically software which is preloaded on a new computer or included in programs that you download and install A Simple Checklist To Safely Installing Free Software Without All The Junk A Simple Checklist To Safely Installing Free Software Without All The Junk Picture this - you've just found this awesome free software that you are stoked about because of all that it can do for you, but when you install it, you discover that it is packed... Read More . Most of the time it’s not dangerous (especially if it was put on by the manufacturer), but it can just be a nuisance. Whether a program falls into one of these slightly depends upon the users, so it’s subjective. But an example might be Norton or McAfee or some DVD playing program. Removing this stuff is definitely a good thing to do How To Remove Unwanted Crapware From Your Brand New Windows 7 System How To Remove Unwanted Crapware From Your Brand New Windows 7 System Read More as it frees up valuable space and just cleans up your nice new computer a bit. But does require some caution as well – you certainly don’t want to go removing programs that you don’t know about. So, when in doubt leave it or better yet, research it online to find out more about that program. We’ve asked you what your solutions are for bloatware (or crapware) and you’ve told us. Revo Uninstaller is a superb program for this Revo Uninstaller Will Hunt Down Your Bloatware Revo Uninstaller Will Hunt Down Your Bloatware Read More as well as PC Decrapifier and Geek Uninstaller GeekUninstaller Will Uninstall Programs You Thought You Couldn't [Windows] GeekUninstaller Will Uninstall Programs You Thought You Couldn't [Windows] When it comes to third-party uninstallation software, everyone knows of Revo. It's often considered to be the top of that class. 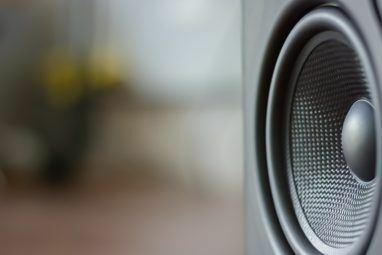 However, many alternatives exists and it's great to offer the MUO audience a choice.... Read More . Windows System Restore is another very easy-to-do task that only takes a few minutes. To get started, type in “System Restore” in the Windows Start Menu. Once opened, simply follow the prompts to create your system restore point. In the future, you should also always create a restore point when prompted to by a program or your computer. Often they will be made without your knowledge, which is nice when that happens, but it’s always good to make sure that you have a recent one available. You can do this by setting up a schedule, which Ryan covers in his article How To Make Sure Windows System Restore Works When You Need It How To Make Sure Windows System Restore Works When You Need It How To Make Sure Windows System Restore Works When You Need It System restore is not an automatic feature in Windows 7. Usually it is enabled when you've purchased a new system, but after running updates, installing system tools or running any other list of tasks that... Read More . Once all of that is in place, make a backup. If you haven’t installed your programs yet (which we’ll cover in a later article), I recommend just using an external hard drive. You should have already used it to set up the scheduled backup routine so just go ahead and run that for the first time. For information on the easiest way to bring your files over, check out the section titled “Moving Your Existing Files Over To Your New Computer” in the first article of this series Getting a New Computer, Part 1: How to Transition From Your Old PC to Your New One Getting a New Computer, Part 1: How to Transition From Your Old PC to Your New One Ahhh! The joy of a new computer! An opportunity to start fresh and leave all the worries of your slow, dusty, old computer in the past. However, whether you've just purchased a new computer or... Read More . In addition, an excellent way to make use of that old computer if it’s still running, is to use it for storage as well. So don’t forget about that! You can start using your computer now. But you should really not bring your bad habits along with you. Of course it’s natural at first to be careful, but after a while it’s easy to fall back into the same ruts that you had with your previous computer. Ruts like eating at your computer, or storing (if it’s a desktop) or using it in low ventilation areas, like on your bed with blankets or “stuffing” the tower in a cabinet under your desk. Of course there are many others, so just be aware preferably while your using your old computer (unless you’ve already made the transition) of your bad habits. It’s never too late to change them. Don’t eat food at your computer. Be more careful with it. Watch where you browse Browse Safely With Your Own Internet Bodyguard Called WOT Browse Safely With Your Own Internet Bodyguard Called WOT Read More and what you download. Be more conscious about battery life An Energy Saving Masterclass For Computer Users An Energy Saving Masterclass For Computer Users About 10% of an average home’s power use is dedicated to computers. That is the average for the United States, however, and is only an average. Users who are computer enthusiasts may find that their... Read More . Conserve power An Energy Saving Masterclass For Computer Users An Energy Saving Masterclass For Computer Users About 10% of an average home’s power use is dedicated to computers. That is the average for the United States, however, and is only an average. Users who are computer enthusiasts may find that their... Read More – don’t leave your PC and/or monitor always on. 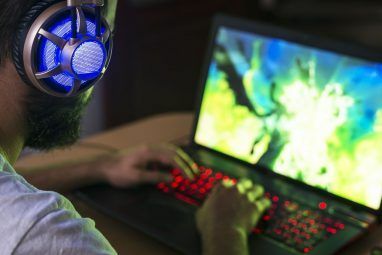 Don’t use your PC in low ventilation locations 5 Cool DIY Ways To Keep Your Laptop Cool 5 Cool DIY Ways To Keep Your Laptop Cool Read More . Clean up your desktop How to Clean Up Your Windows Desktop Once and for All How to Clean Up Your Windows Desktop Once and for All Clutter is more detrimental than you realize. A tidy Windows desktop makes things easier to find, is more pleasing to look at, and reduces stress. We show you how to get your desktop in order. Read More and keep it clean. Organize your files and keep them organized Creating Order From Chaos: 9 Great Ideas for Managing Your Computer Files Creating Order From Chaos: 9 Great Ideas for Managing Your Computer Files It's frustrating isn’t it when you can’t find that file? When you’ve searched every folder imaginable on your computer, and somehow it got lost….or worse, deleted. Now, there are excellent search tools for Windows that... Read More . Reserve the need to use registry cleaners Don't Believe The Hype: Registry Cleaners Don't Make Windows Faster Don't Believe The Hype: Registry Cleaners Don't Make Windows Faster Much advice has been given on how to keep your computer running smoothly, as well as how to fix it when it has become slow. We have even published a Windows on Speed guide, written... Read More – because they hardly help Using Registry Cleaner: Does Is It Really Make a Difference? Using Registry Cleaner: Does Is It Really Make a Difference? Advertisements for registry cleaners are all over the Web. There’s an entire industry out there bent on convincing inexperienced computer users that their registry needs fixing, and that, for ten easy payments of $29.95, their... Read More . And definitely don’t let it get stolen Tools & Techniques For When You Must Leave Your Laptop Alone In Public Tools & Techniques For When You Must Leave Your Laptop Alone In Public Ideally we would never leave our laptops from our sight, especially in public. And there are definitely areas like airports and public transit where you should never consider it an option. But since becoming a... Read More . Now that you’ve done all of these you can finally get started downloading programs on your computer and enjoying things like customizing the desktop, which was mentioned in the first article Getting a New Computer, Part 1: How to Transition From Your Old PC to Your New One Getting a New Computer, Part 1: How to Transition From Your Old PC to Your New One Ahhh! The joy of a new computer! An opportunity to start fresh and leave all the worries of your slow, dusty, old computer in the past. However, whether you've just purchased a new computer or... Read More . Do have any more “new computer rituals” that you do before you dive into using your brand new machine? If so, share them with is in the comments below! i just bought a laptop and i already used my laptop for many hours. I didn't know that i need to charge it first. Is it safe to charge it now? This is good information! Thank you for posting! Don't forget to update those drivers. Regarding drivers, I'm more of the mindset: If it ain't broke, don't fix it. I disagree about registry cleaners. While they won't speed up your machine, there's no reason to allow Windows and crappy third party programs clutter your Registry with incorrect and useless entries. Frankly, given that the Windows Registry is THE number one point of failure in the system, I don't trust Windows to keep it stable by itself - and I certainly don't trust third party programs that use the Registry as a personal database against Microsoft orders not to do that. Use a Registry cleaner like CCleaner and a Registry backup and compaction utility to recover no longer used space. There are plenty of good free ones around. There may be a slight risk in using these tools, but I've never had CCleaner do anything that was identifiable as a problem. The rest of the advice is very good. What part are we disagreeing about registry cleaners exactly? I agree completely with using CCleaner -- it's awesome. Sure it does clean the registry, but I never say not to use it. When I link to the article about not using Registry cleaners, I'm talking about programs dedicated to that. Uninstallers like Revo and Geek Uninstaller remove Registry values too and I agree with using those. This is starting to get into what one of the next articles covers, so I'll stop there. But I just thought I'd let you know that we aren't disagreeing on that topic. In addition, you mentioned a "Registry backup utility" -- did you know CCleaner can backup the Registry as well? Just looked at CCleaner's Registry options....it has the ability to backup CHANGES it will make to the registry, but I don't see an option to back up the ENTIRE registry. Ah! You're right. Good catch there. Thanks for checking on that. While your articles is Windows-centric, the same advice applies to Macs and Linux PCs. "Don’t eat food at your computer." That one should be "Don’t eat food OR drink at your computer". Food crumbs just make the keyboard look messy but can be vacuumed out. Liquids, at worst, can get into the inner workings of a laptop and short it out or short out the keyboard on your PC. At best, liquids can gum up electrical contacts causing intermittent problems, and their residue is very hard to remove. One should not smoke while working on the computer. Ashes, like dust, can get into all the nooks and crannies of a computer. As a tech I have seen quite a few PC with nicotine and tar deposits on fans, chips and vital parts. Very valid point there. I'm not a smoker so that didn't even cross my mind, but that's definitely true. As far as the drinks go though, I don't know if I could NOT have something to drink while working. I keep it far enough away from my laptop that it's not a risk. Sure, things can happen, but I think something called "reason" can help prevent the majority of accidents. Still all good points though. Thanks for the comment. "I think something called “reason” can help prevent the majority of accidents." From your comment it sounds like you're a smoker. I was not making a moral judgment about smoking. We all have our vices. I was just relating my experiences. The worst I have seen was computer that looked as if someone dumped used engine oil all over the inside and it stank of nicotine. When I saw/smelled that, I closed the case and put the PC out on the curb for garbage. Are you saying that all people who eat and/or drink when using a computer are smokers? Then there must be a lot more smokers than the statistics show. I've just come from a coffeehouse with free wifi and there sat almost all with laptops and coffee cups something I wouldn't dare to. My error. You said "I agree about eating and drinking when using the keyboard on a laptop" from which I assumed that you do not agree with not smoking at the keyboard. One thing you didn't cover, which I thought was inexcusable, is installing a decent antivirus program and/or anti-malware. Most new PCs are sold with a "trial" version antivirus program, like a 30-day license of Norton or McAfee. Remove that junk and install something with a one-year lifespan, such as AVG, Avast!, or something else reputable. Don't worry -- I didn't forget about it. That comes in the next article (Part 3) about what software to install. There were some grey areas between some of these articles. Ideally they would have all been one article, but I had to draw a line somewhere and so after much debate I decided to put the antivirus section in the article covering the installation of new software. Definetely some good tips. I recently learned about creating a system image after it being talked about somewhere on makeuseof, use this for my mums laptop which needed a restore to factory settings (just easiest for her situation, i know you can clean it up and stuff) remove a bucketload of HP bloatware and now have peace of mind it won't take me anywhere as near as long next time as it did this time.